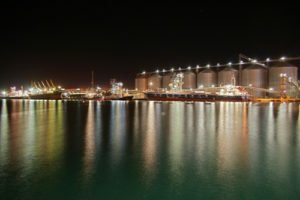 The global agricultural trader Cargill and the Ukrainian company M.V.Cargo launched Phase 1 of the new grain terminal at the port of Yuzhny in Odessa region on the Black Sea last Friday, informs Interfax-Ukraine. President of Ukraine Petro Poroshenko took part in the official opening. One of the largest investment projects in Ukraine of the recent years, the construction managed to bring in USD 74 mln of loans from the European Bank for Reconstruction and Development and the International Finance Corporation. The total cost of the terminal is assessed at USD 150 mln. 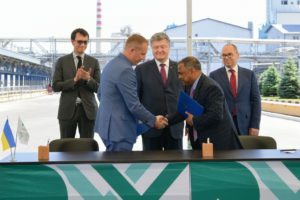 The new grain facility in the deep-sea port of Yuzhny with the capacity of 5 mln tonnes was initiated in August, 2015, when Cargill, M.V.Cargo and the Ukrainian Sea Ports Authority signed the corresponding Memorandum of Intent. According to this document, M.V.Cargo was undertaking to build the landside terminal complex and the Ports Authority was to create the access channel and the harbour basin of berth #25. The Memorandum also fixes the intent of Cargill to acquire 51% of the terminal. The terminal is designed to have a 486m long berth with a draft of 16m to accommodate Post-Panamax vessels and the storage capacity of 290 th.tonnes provided by 14 silos by 15 th.tonnes each and a warehouse of 80 th.tonnes. With good rail and road connections, it is forecasted to handle over 10% of the national grain exports. The facility is expected to be fully operational in autumn this year and to handle about 1 mln tonnes by the year end. Currently, the significant share of Ukrainian grain is exported through TIS-Grain terminal in the port of Yuzhny. In 2017, the terminal handled 5.6 mln tonnes of grain. Besides, there are two more grain facilities in Yuzhny and one more company has just recently communicated its plans to construct another grain terminal there. At the Ukrainian Ports Forum 2018 that took place last week in Odessa, Techagro announced that it plans to build three terminals in the Yuzhny port – for grain, container and general and bulk cargoes. The grain facility is designed with a capacity of 4.5 mln tonnes annually and is scheduled to be operational in 2021.